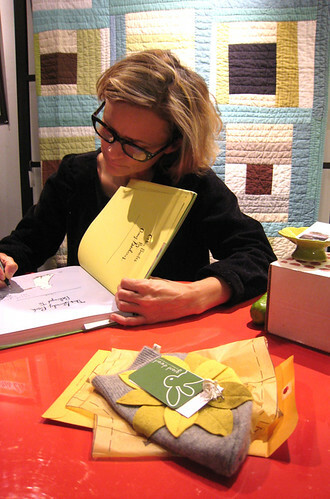 I met Amy Sedaris last year at the BUST Craftacular in Manhattan. I was there selling Giant Dwarf goods with my friend Mary, who was slinging her most delicious sea salted + lavender infused caramels. The queen of kitsch was selling + signing her wonderful book, I Like You: Hospitality Under the Influence. She was also selling some handmade crafts like frilly embroidered pot holders and anthropomorphic hamburger I Like You calendars. Mary + I skipped on over to her table, which was only a few spots down from us, before the crowd usurped our only chance to spend a few moments with our crafty idol. As we were deciding on what to buy, and remain calm while doing so, Amy complimented me on the hat I was wearing. One of my hats that I made! I couldn't believe it! As the craft fair dwindled, Amy dashed over to our table, but stopped short before she could take a peek at what we had to offer. She was super busy and had to get back to her fans, and at that moment I realized I should have given her the hat right of my crown. 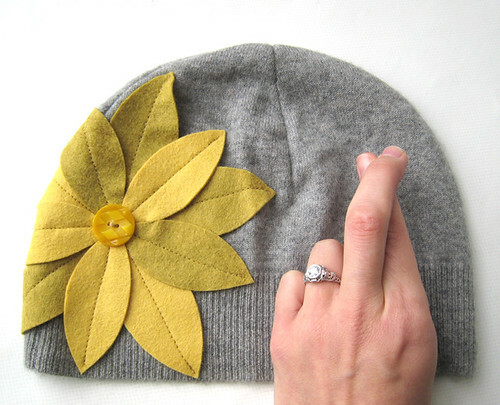 So, when I found out that she would be in town promoting her new shiny paperback version of I Like You: Hospitality Under the Influence, I decided to make a hat for her that would replace the one I should've given her in the first place. The event was held at Foster's, which sells delightful urban homeware + gourmet cookware. They offer cooking classes + demonstrations in the back room of their enormous shop. Tickets went on sale for 50 bucks a pop, which quickly sold out, but fortunately, they offered standing room only free of charge. I got there early, all by my lonesome, and scored the perfect seat on the floor. As the room began to fill with fans alike, we all decided to stand as the clock struck 5. Amy was introduced by a lovely employee and graced us in a black velvet dress and an adorable homemade owl apron studded with, you guessed it, googly eyes! She began cooking a few recipes from her book with Michael O’Holloran, Chef + Owner of Bistro 7, a frenchy restaurant here in Philly. The cozy space smelled delicious and was sparking with Amy's hilarious energy. After the duo finished their Chicken of the Taverns dish + poppped the brownies in the oven, Amy began taking questions from the audience. She got a mouthful from her spectators, including questions about her family, her appearances on talk shows, and a shy + quivery question from me about her rabbit Dusty and her cameo in the terrific Rabbit Rescue, an endearing Microsoft Commercial. After a lengthy Q + A, Amy said a polite thank you + goodbye and began setting up for her book signing, where I would finally get my chance to give her one of my cloche hats. I held lucky number 67 and waited patiently in line to meet the lovely + talented glue gun guru. After waiting for what seemed like forever, all of a sudden I was next in line. I froze. A handsome man spotted my nervousness while I was fumbling to get my book, camera, and gift ready with the only 2 hands I was given. He graciously held my things and arranged the recycled pattern paper wrapper for the most perfect presentation. His generosity saved me and he couldn't have been more excited that I made something for her. I thanked him and crossed my tangled fingers as my brain told my feet exactly what to do. I walked over to her table and introduced myself. She said she remembered me and my hat from the Craftacular, which prompted the perfect moment to introduce her to Giant Dwarf. I gave her the hat I made and she was so appreciative. She tried it on and said how good everything smelled and how soft everything felt. I blushed and then our picture was taken together. I could've stood there the entire night. She made me feel so comfortable + confident, but I decided to mind my manners and let her sign my book and I would be on my way. Thank you for the adorable hat - I love it! I thanked her again and she thanked me back. As I gathered my things, she gave me something that she made - a tissue paper ghost, just in time for Halloween. How cool!!! Congrats, I hope we get to see the photo together!! I LOVE amy Sedaris. I love that she is unaware of her fame, makes cupcakes to sell in her hood and has pet rabbits. I too saw the microsoft comercial. SO cute. That's awesome! I love Amy Sedaris, too and would also have been completely nervous. You probably made her day! ooh! lucky girl! what a great story! i hope she wears one of your amazing hats for lots and lots of photos.